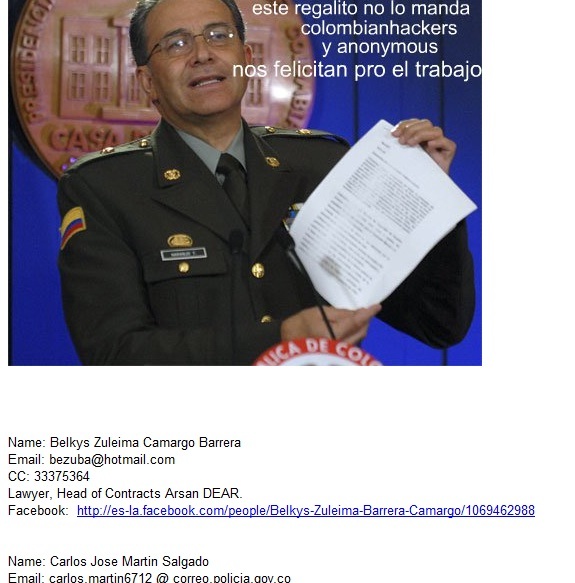 Colombian Anonymous Hackers announced that they had sent spam bombs to some 250 officials of Colombia's national Police (http://colombiareports.com) and revealed personal data of employees of the National Police inviting the public to harass the officials Here. In a statement published online, the hackers thanked the National Police "for keeping us submitted and trampled." In the same statement, the group "Colombian Hackers" released personal information on hundreds of police officials, some with home addresses and identification numbers. Colombia Wednesday celebrated its 201st anniversary of its declaration of independence of Spain. The hackers had announced an independence offensive the day before.